Presented by Kaldor Public Art Projects and the Art Gallery of NSW, and curated by Ross Gibson, Centenary Professor of Creative and Cultural Research, University of Canberra, and Jonathan Jones, Spot Fire 2: Spectacle, manifestation, performance considers the history of spectacle in Sydney and interrogates the grandiose cultural vision that promoted the Australian colonies to the world. Housing the Sydney International Exhibition of 1879–80, the ostentatious Garden Palace completed the Chief Colonial Architect of New South Wales James Barnet’s vision for Sydney. Gesturing out to Middle Harbour and the Heads, it was the city’s way to boast of its burgeoning colonial enterprise. But the Garden Palace’s magnificence was fleeting, lasting only three years. 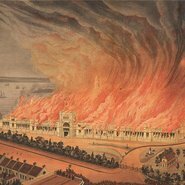 In 1882, in an ultimate spectacular display, the palace and all its contents were destroyed by an intense fire that took only a few hours to obliterate everything except the gates at the south-west entrance to the grounds. Spot Fire Symposium 2 is presented in anticipation of the 32nd Kaldor Public Art Project, Jonathan Jones’s barrangal dyara (skin and bones) , which will transform the site of the historic Garden Palace in Sydney’s Royal Botanic Garden from 17 September to 3 October 2016. The event will also be live-streamed online.